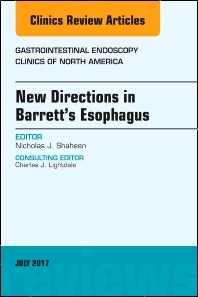 Dr. Shaheen's issue of Gastrointestinal Endoscopy Clinics of North America addresses the current thinking and clinical decision making surrounding endoscopy for Barrett's Esophagus. Expert authors have contributed articles on the following topics: The Troublesome Epidemiology of Barrett’s Esophagus and Esophageal Adenocarcinoma; Who Deserves Endoscopic Screening for Esophageal Neoplasia; Alternatives to Traditional per oral Endoscopy for Screening; Effectiveness and Cost-Effectiveness of Endoscopic Screening and Surveillance; The Role of Adjunct Imaging in Endoscopic Detection of Dysplasia; Beyond Dysplasia Grade: The Role of Biomarkers in Stratifying Risk; Management of Nodular Neoplasia in Barrett’s Esophagus: Endoscopic Mucosal Resection and Endoscopic Submucosal Dissection; EUS and Management of Superficial Esophageal Neoplasia; Radiofrequency Ablation of Barrett’s Esophagus: Patient Selection, Preparation, and Performance; Radiofrequency Ablation of Barrett’s Esophagus: Efficacy, Complications, and Durability; Cryotherapy of Barrett’s Esophagus; Care of the Post-Ablation Patient: Surveillance, Acid Suppression and Treatment of Recurrence; and Surgical Management of Superficial Esophageal Neoplasia. Readers will come away with the knowledge to diagnose and treat neoplasia and Barrett's Esophagus using the latest techniques.